The forty plus year career of The Allman Brothers Band puts them in a fraternity that few bands can ever join, that of ‘greatest bands of all-time.’ For this week’s piano instruction irocku goes back into the vault for a 1972 classic, Ain’t Wastin Time No More from the legendary, Eat a Peach album released only months after the tragic death of slide guitar phenom, Duane Allman. 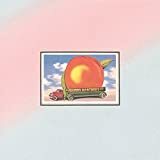 The double album is considered by many to be a rock masterpiece, reaching number 4 on the Billboard charts and including the 33 minute long, Mountain Jam which epitomizes the glory of a live Allman Brothers Band concert. Eat a Peach was the farewell performance of musical icon, Duane Allman. It includes the last three songs he recorded along with material written after his death in October of 1971 from a motorcycle accident. Not long after the album’s release, brother Berry Oakley met with the same fate as Duane, killed in a motorcycle accident in November of 1972. Ain’t Wastin Time No More, our piano lesson for today, begins with a funky medium tempo groove on piano and is soon joined by a beautiful slide guitar with Gregg Allman providing a hauntingly soulful vocal about love, loss, and moving forward. The melody itself moves from mellow funk/soul to blistering emotional energy provided by Duane Allman’s slide guitar solo. Combined with Allman’s vocal about picking up the pieces of one’s life in the wake of tragedy, it represents a rebirth, like a phoenix ascending out of the ashes. That is the story of the Allman Brothers Band. Despite the loss of two members at a early period for the band, they carried on with Dickey Betts assuming the role of lead guitarist and Chuck Leavell joining as a second piano man. Forty years after the release of Eat a Peach, the band is still on the road and even though the line-up has changed over the years, one thing remains, The Allman Brothers Band still puts on a great show and continues to earn its reputation as one of the greatest rock bands of all-time! For this piano lesson Ain’t Wastin Time No More begins with a piano groove that is a total blast to play. Once you get it down it flows off your fingertips. It’s based on a two-chord pattern that you will find in many Allman Brothers songs. So learn it well, you’ll be able to use it a lot! Levels 1 and 2 Practice the C Major scale and learn the C Blues scale.First Week Beginners practice the Lesson. Intermediate and Advanced students practice the Groove Chart and the Lesson. Second Week Add the Exercise and Improvisation to your practice. "Ain’t Wastin Time No More" begins with a laid back piano groove. Once you get it down it flows from your fingertips. It’s based on a two-chord pattern that you will find in many Allman Brothers songs. So learn it well, you'll be able to use it a lot! Level 3: The quickest way to rock is by learning the Groove Chart! To help with improvising, practice the C Major scale and learn the C Blues scale. Also learn the C7, G, F7, D7 and Gm chords.First Week Beginners practice the Lesson. Intermediate and Advanced students practice the Groove Chart and the Lesson. Levels 4 and 5: The quickest way to rock is by learning the Groove Chart! To help with improvising, practice the Bb two-octave scale and learn the Bb blues scale. Also learn the Bb7, F, Eb7, C7 and Fm chords.First Week Beginners practice the Lesson. Intermediate and Advanced students practice the Groove Chart and the Lesson. Levels 6 and 7: The quickest way to rock is by learning the Groove Chart! To help with improvising, practice the Bb three-octave scale and learn the Bb blues scale. Also learn the Bb7, F, Eb7, C7 and Fm chords.First Week Beginners practice the Lesson. Intermediate and Advanced students practice the Groove Chart and the Lesson. Great song. Here is a video of me playing through the song from the lesson. Umm, how do I open my groove charts? The Groove charts are available for levels 3 thru 7. First select the level and for levels 3 thru 7 the Groove chart links are the first links under Videos and Sheet Music. Keep rockin! Arrangements are very well done for solo piano. I would be interested too in a stripped down arrangement that reflected the actual piano part in the entire band. hello I am having trouble downloading the videos. when I go to download them, they just pop up in windows player. Thanks for the question. Each internet browser has a different way to download linked files. Depending on how you have your browser configured the steps might change, but for most default setups you would right click on the link and then select either ‘ Download linked file as…’ or ‘save link as..’. In Firefox you night need to left click instead of right clicking. I was wanting to practice the groove chart for Ain’t Waistin Time but I can’t find anything for putting together the notes for the chords. I looked in piano resources but there is nothing that comes up for chords. Any suggestions? Under the piano resources there are links to Scales, Chords, and Arpeggios. Under the chords we have videos and printed sheets for all the Major, Minor, Dominant 7 and Suspended chords. Enjoy! Awesome. Working now by the way! FANTASTIC METHOD OF TEACHING. THIS IS WHAT I AM SEARCHING ALL THROUGH THESE YEARS. Same here brother! I totally agree with you. After losing the use (top knuckle portion)of my ring finger on my left hand a few years ago, (fairly polished professionally working guitarist, some keyboards, a share of vocals) I threw in the towel. There was no way I could ever to play to my standards 43 of years, so I quit. Believe me, I stunk a lot of things up trying. However, I was a HUGE A.B.B fan all this time, but couldn’t figure Chuck’s intricacies by ear. Collin is truly a great instructor, his feel for each song, and and his gift of portraying that feel through his graceful, yet to the point comments. I may still have some gigs in me left now!! This program is truly a GODSEND! These downloads will not download! Thanks for contacting us. We apologize that you’re having troubles downloading the lessons. We have thousands of folks accessing the site and downloading the videos so we’ll figure out a way to get you rockin’. Are you on a wireless network? The network might be slow and the connection could be timing out. If this is the case, please try accessing the site again, preferably on a faster network. Each internet browser has a different way to download linked files. Depending on how you have your browser configured the steps might change, but for most default setups you would right click on the link and then select either ‘ Download linked file as…’ or ‘save link as..’. In Firefox you might have to left click instead of right clicking. If you continue to have troubles, please let us know and we’ll figure out a way to get them to you.